How to work a white shirt. You can never go wrong with a basic white shirt, a timless classic. You can dress them, up, down, rock an androgonous look, or edge them up with leather, the variations are endless. A staple item every wardrobe needs. I love how different our looks are here even though we are both wearing white shirts and black jeans. Mallory and I both have such different styles, I’m definitely a lot more simplistic with my style, I live in neutrals and jeans. That’s always my go to outfit. Since being pregnant I’ve stuck with my trusty neutrals, just wearing longer tees to cover my ever growing bump. Im wearing a white maternity shirt and black maternity jeans from Topshop. My leather jacket is from Mango and my trainers are Zara. Mallory loves embellishment, her style is much more dressed up then mine. She tends to be quite bohemiean, she lives in floaty blouses and shirts with pretty detailing, her style is much more girly. 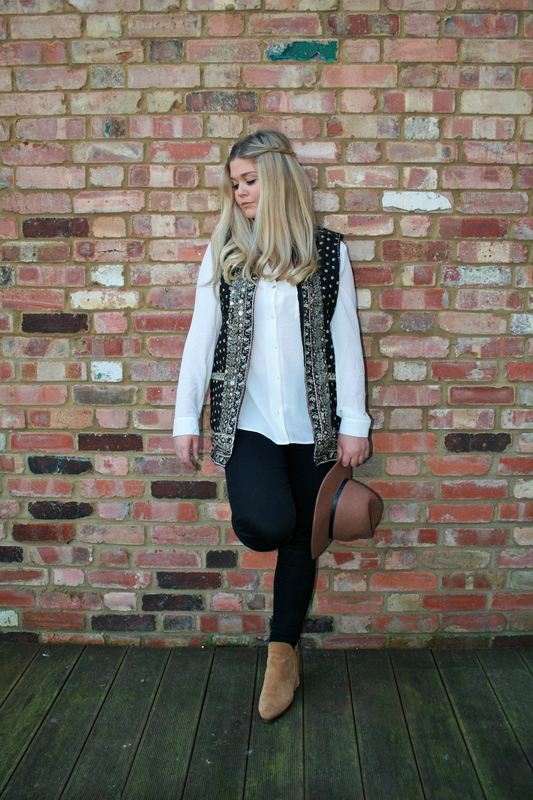 Mallory is wearing a white shirt from Newlook, black jeans from River Island, Zara fringed boots and a Zara embellished waistcoat.